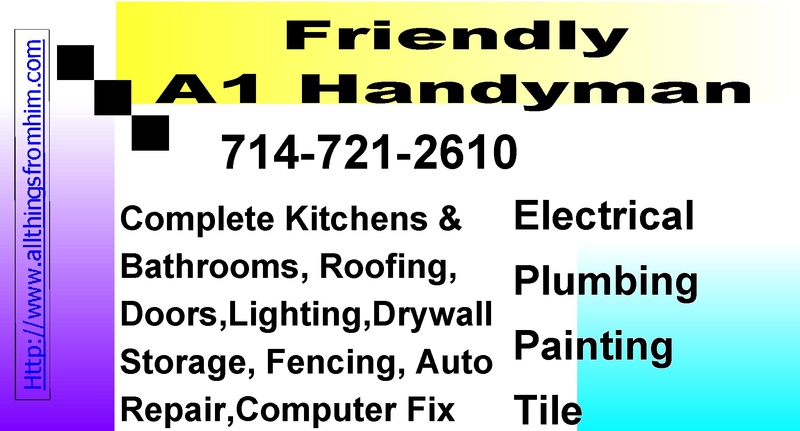 Services: Small Appliance Repair, Carpentry, Concrete, Painting - Int/Ext, Plumbing all types, Electrical all types, Roofing, Doors and Windows, Complete Kitchens and Bath or Repair/Upgrade, Tile, Hardwood flooring, Drywall Repair, Moldings, Electric Car stations, Solar panels, Sprinkler Systems, Car Repair/Maintenance, Lighting, Fencing, Landscaping, Block Walls and extensions, Patio fixtures, Roof venting (whirlybirds), Ceiling Fans, Computer setup and upgrade/repair, Closet or Garage storage or Storage buildings, Auto detail wash and wax, Pickup and Delivery, AirPort Service (up to 6 Passengers) and many many more, just ask? Some work may require a City Permit. Background: Currently from Santa Ana, CA, originally from Sellersville, PA located in Eastern PA between Allentown and Philadelphia. Studied in Philadelphia at the Institute of Computer Science around 1970-72 then came to CA in 1978. I continued as a Cobol, CICS, Total Contract Programmer (BM DP Consultants) for the next 20 years. Converted to Microsoft/Novel Networking and PC Support Contractor services in the late 1990's until about 2002. During this time I did handyman work from about 1985 part time to 2001 when Computer contracting slowed. From 2001 till present I have been doing some computer work but mostly Contractor Handyman work. I enjoy solving problems for people, remodeling Kitchens and Baths, help the poor with low rates and at times offer free help to those in need. I am 6' 1" blond Caucasian and middle aged. I am a US citizen and have roots from Lithuania. I am happily Married to a wonderful woman, Helen, and we love the Lord and live to Glorify Him in our Business and personal life. I work for all types of people and have several accounts with Apartment owners. My prices are lower than normal and I give free estimates on larger projects.